These days, a simple slogan like this one sitting in a window shop wouldn’t be enough of a bait to catch the eye of an average passer-by. As it appears, we’re too busy staring at our smart screens to notice a real-life deal even if it pokes us in the eye. Put this minimalist slogan up on the web, though, and your business might just get lucky, granted you know how to design the giveaway so that it comes across to your potential customers like an offer they simply cannot refuse. And just how do you do that? There’s actually quite a bit of online marketing wisdom behind smart giveaway designs, but if you’re new to the game and in dire need of expert know-how, you’ve come to the right place. In the article below, you’ll find everything you need to know about the stuff that giveaway dreams are made of. Keep scrolling if you want to use this tool to boost your brand’s conversion, traffic, and online visibility without major advertizing investments in tow. Do you want to display an image of the prize on the campaign page? Is there any particular hue (or combination of hues) which you should use for the giveaway, such as your brand’s color scheme? Are there any giveaway sponsors/partners whose logos you need to feature on the giveaway entry page? What is the occasion of the giveaway? What about the theme, fonts, colors, and the design’s emotional appeal to your target audience? What action do you want the viewers to take after seeing the page? Where will you display the CTA button, and should you use one or more of them? Will you accompany the header by an explanation, and if so, how will you word it? 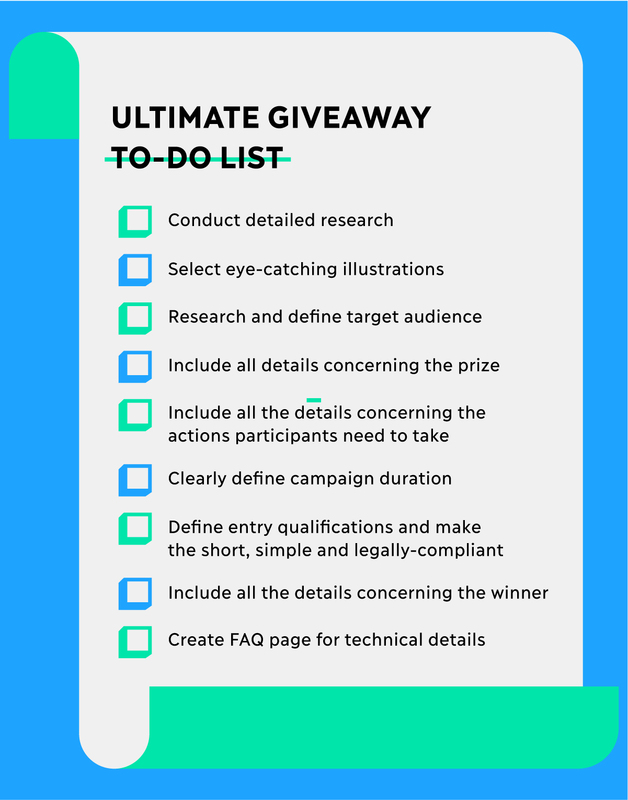 These are just some of the key questions you should take into account when you set out to stage an online giveaway. Make sure you tackle them before proceeding with the design proper. For instance, a Mother’s Day giveaway with flower prizes will work best if conveyed by a page featuring soft pinks, light yellows, and whites, whereas its Christmas counterpart which commands attention should feature at least a touch of green and red, for the sake of the holiday cheer. The same goes for the fonts: the closer they are to your brand logo, the better – and if you want to draw attention, you can always make the font slightly larger in the header than elsewhere on the page. That way, you’ll achieve a well thought-out website impression and keep visual distractions to the minimum, thus allowing the viewers to smoothly navigate the page until they click on the CTA. For best effects, limit the header text to 6 or 7 words, and follow up the action prompt by a cleverly designed 2- or 3-word CTA. For example, a Christmas giveaway featuring a trip to LA as the prize can be summed up by a header that says ‘Why not spend Christmas in LA?’ with CTA which prompts the viewer to ‘Sign Up Now’. To make the header text stand out, you can use a catchy font color that coordinates well with the rest of the page. Also, it would be a good idea to use the same font in the header text and the CTA: this simple trick will guide the viewer’s eye from the proposition voiced in the header to the next step they’re supposed to take in order to get a chance to claim the prize. The giveaway explanation will be much smaller than the header message in terms of size, so you should pick a font that allows you to list all relevant details about the campaign while keeping the text easily legible for an average viewer. Put simply, if the header text is the bait, the explanatory text listing the prize description and/or benefits and other key giveaway details is a double hook that helps make sure the viewer doesn’t navigate away without taking the action you want them to take. To stay on the safe side of giveaway design, try to avoid long-winded explanations which may seem boring or off-putting for the viewers: you wouldn’t want to fumble with lots of fine print when entering a contest and neither does your website visitor. For maximum turnout, make the explanation short and use bullet points to list prize or giveaway details if necessary: that way, the entry form won’t come across as cluttered and you’ll boost the likelihood of the viewers hitting CTA and turning into your email list subscribers without much hesitation. Even if you’ve come up with a top-notch giveaway entry page design, it still won’t make much difference for your brand unless it attracts the attention of your target audience. To ensure quick and high giveaway turnout with minimal investments, you should include at least two social media sharing buttons on the dedicated page to make sharing super-easy. In addition to that, you can also offer special boons for viewers who endorse or share the giveaway on their Facebook or Twitter profiles. Not only will this inexpensive and simple yet highly efficient trick get more eyeballs on your brand, it’ll also boost your following, online community engagement, and help you grow your lead database. Getting people to share or post about your giveaway is one of the simplest ways to reach a new audience and win them over with the help of inexpensive tokens of appreciation – and once the crowds realize that your brand is a byword for quality and user satisfaction, your conversion rates will skyrocket in a flash. Advertizing the giveaway on just one or two online marketing channels is like using only one loudspeaker even though you have a surround system at your disposal. Although not all digital marketing tools are equally effective when it comes to a giveaway promotion, it’s still better to multi-channel your advertizing efforts and post about the campaign on every social media account your brand has at least once or twice a week (frequency will largely depend on the giveaway duration and usual posting agenda). For max giveaway turnout, you can send out a newsletter to the people on your mailing list but make sure to keep the email short, informative, and focused on the prize benefits or dollar value. According to a recent case study, giveaways are a great way to convince people to disclose their email to your brand even if they aren’t ready to make a purchase right away. You can use their personal data to engender deeper interest in your brand by cleverly worded promo emails or entice them with new giveaways once you’ve added them to your lead database. Once you get the giveaway off the ground, you should monitor follower engagement and adjust your advertizing across channels in line with the analytics. Another smart way for maximizing the appeal and return of your giveaway campaign is to solicit feedback from your followers and use the information to tweak your giveaway advertizing strategy. For instance, if you find that your Twitter followers aren’t as enthused about your campaign as your Facebook crowd, you can either forgo Twitter as a promotion channel or reduce giveaway posting frequency in favor of another, better-performing platform. Furthermore, if your giveaway doesn’t prove as successful as you initially hoped it would, you can carry out a survey and prompt your followers and subscribers to give suggestions which you’ll then be able to use to fine-tune the next campaign. In fact, follower feedback and analytics are the most reliable tools you have at hand when it comes to social media contests, so keep your finger pressed to the pulse of your target audience 24/7 and you’ll be okay. If you don’t want to take your chances with self-made giveaway designs, you can always use a ready-made template instead. Pre-designed giveaway entry templates powered by PromoSimple are easy to handle and they also offer a range of customization options you can use to fine-tune the layout, color scheme, fonts, images, and other important elements of your sweepstakes form design. For a smart bonus, you can also select the elements of the entry form which you want to display or hide, such as headline background, number of days left, and the number of winners. If you don’t like the images featured in the gallery, you can upload your own and use them for the giveaway background. In addition to that, you can also input your own color selection for giveaway form elements such as borders, buttons, and backgrounds, and you can also take your pick from a range of available fonts. Full customization is available for users in Blog, Business, and Agency categories, so you will be able to design a suave and unique campaign even though you’re using a template. If you’re still here, your giveaway design is half-baked: use the tips listed above to come up with a winning contest entry form which you’ll promote on your social media accounts, and superior results will quickly follow suit. You’re welcome.